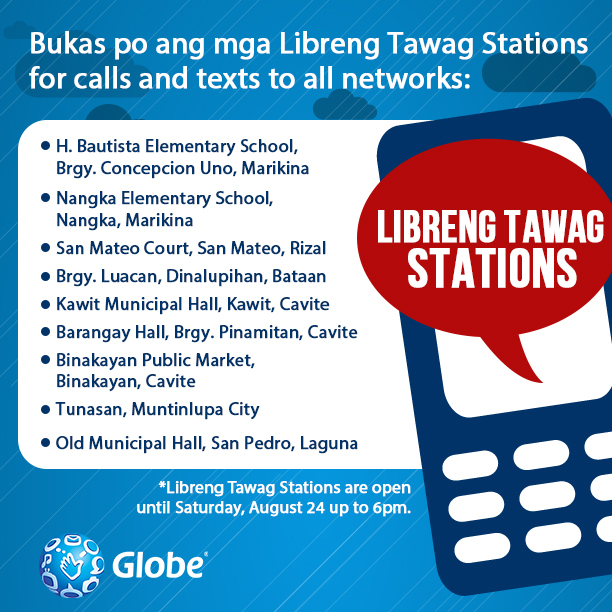 Globe Libreng Tawag Stations are still open to help our fellow flood victims on typhoon Maring and ‘Habagat’. To those who want to contact their love once, this program is still open until Saturday, August 24 up to 6PM.To know the list and areas where this Libreng Tawag stations is available you may find the list below for your reference. H. Bautista Elementary School, Brygy. Concepcion Uno, Marikina. Nangka Elementary School, Nangka Marikina. If you’re near on those mentioned area, you may inform your neighbors and friends who are in need on this kind of service.